Five technology companies, Rackspace and Indiegogo among them, took to Capitol Hill on Thursday to testify in front of the House Judiciary Committee about the importance of technology to innovation. The hearing, in front of the Subcommittee on Courts, Intellectual Property, and the Internet, followed one last week by a group of copyright holders and their industry organizations. Amid a sea of feel-good talk about the benefits of open source, Rackspace VP of Intellectual Property Van Lindberg made some really good points about the drawbacks of current copyright law. The core of his argument is that, although the Digital Millennium Copyright Act might be fair, it’s also very prone to abuse. Lindberg specifically cited the abuses that come from computer systems programmed to recognize a copyright holder’s content and automatically send DMCA takedown notices. He noted how one Rackspace customer, a movie studio, asked to have content on its own website taken down. Another, a jewelry designer, asked to have an authorized reseller’s site taken down. You might remember when YouTube’s system for flagging DMCA violations resulted in a takedown of Michelle Obama’s Democratic National Convention speech, citing violations of numerous copyrights. Science fiction fans might remember how the live stream of last year’s Hugo Awards was taken down because it aired a clip of a “Dr. Who” episode for which author Neil Gaiman was receiving an award. “Computers may be able to learn how to spot a movie, or a song, but they don’t understand when someone has granted another person approval to use that copyrighted material,” reads Lindberg’s statement. 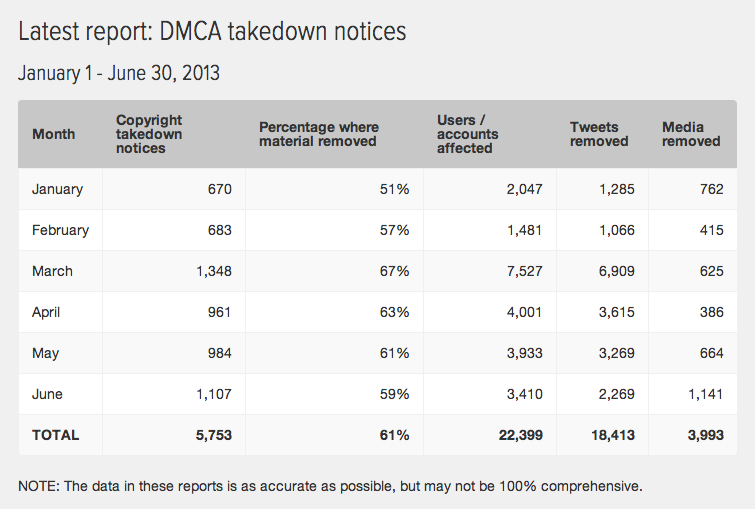 Of course, as Lindberg also noted, automated takedown requests are hardly the only form of DMCA abuse. Believe it or not, people also file them to silence free speech and businesses file them to mess with competitors. As far back as 2009, Google claimed that 57 percent of takedown requests were businesses targeting competitors, and 37 percent of takedown requests weren’t even copyright claims. As much as most people and companies actually value intellectual property rights, Lindberg suggests, stronger penalties and mandates around enforcement will only stifle innovation by exacerbating this problem. Google’s latest transparency report claims more than 15 million URLs have been the subjects of takedown requests in the last month. And that’s just for search — YouTube isn’t included. Takedown requests have skyrocketed in the past 18 months. Because distinguishing between legitimate use and copyright violations is so difficult, it can be easier for companies receiving them to resort to automated systems or just to approve them lest risk litigation. According to the Electronic Frontier Foundation, Google claimed in April 2012 that it complies with about 97 percent of takedown requests. Twitter’s statistics on takedown requests highlight the prevalence of faulty requests. Of the 5,753 DMCA requests it received between Jan. 1 and June 30, 2013 — a 76 percent increase over the previous six-month period — it removed material in only 61 percent of the cases. What’s not clear is whether this discrepancy in compliance rates between Twitter and Google is simply a matter of scale (Google has to automate the process because it can’t possibly have humans analyze hundreds of millions per year) or of more blatantly invalid requests to Twitter. All of this — and famous cases like those of Veoh — makes Indiegogo Founder and Chief Customer Officer Danae Ringelmann’s testimony on Thursday ring a little hollow. “[R]egulation like DMCA has been instrumental in enabling open technology based platforms like Indiegogo to remain open, as DMCA protocols also assume people are innocent until proven guilty,” her statement read. Lindberg’s testimony is just the latest step in Rackspace’s seeming quest to get U.S. intellectual property law under control. Earlier this year, the company made news by promising to fight two alleged patent trolls in court until the bitter end. Its stance then was that large companies have something of a duty to stand up to these entities so they can’t run roughshod over smaller companies without ever taking a financial hit. Lindberg tackled the issue of patent law indirectly on Thursday by singing the praises of open source technology and how much employment and innovation it creates. However, the real heavy lifting went to SparkFun CEO Nathan Seidle, who used his time to point out specific benefits of open source engineering — especially for small businesses — and then call on Congress to protect them against aggressive litigation and to reduce the patent-protection window to 5 years from its current 20 years. Feature image courtesy of Shutterstock user spaxiax. Seems like there’s an even stronger case for computers not being able to understand when a unauthorized use is never-the-less legal because the use is fair. Adding a white-list of ‘sites with permission’ isn’t a huge technical hurdle but such a system would never work for fair use.